When we visited Pencarrow house in Cornwall earlier this year, we were told the story of how an 19th century owner, Sir William Molesworth, bought the first specimen of Araucaria araucana, and planted it in a solemn ceremony before a house party. Upon touching its prickly leaves, the noted barrister Charles Austin remarked “It would be a puzzle for a monkey”. His remark has given the tree its common name of Monkey Puzzle. 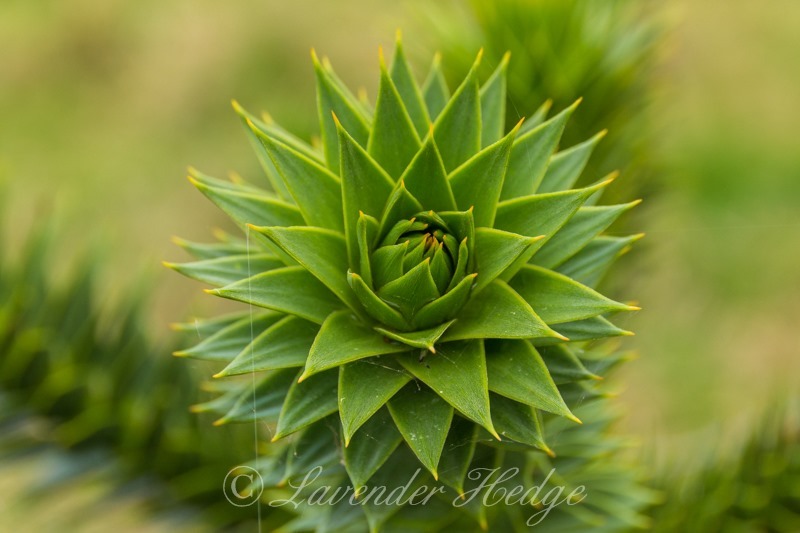 This is a macro of the end of one of the branches of a young Monkey Puzzle tree in a local park. 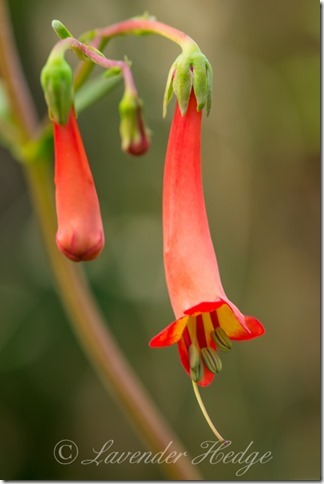 The beautiful tubular flowers of Phygelius x rectus Salmon Leap – also known as Cape figwort or Cape fuchsia. Phygelius are evergreen shrubs, some of which can be a bit invasive. 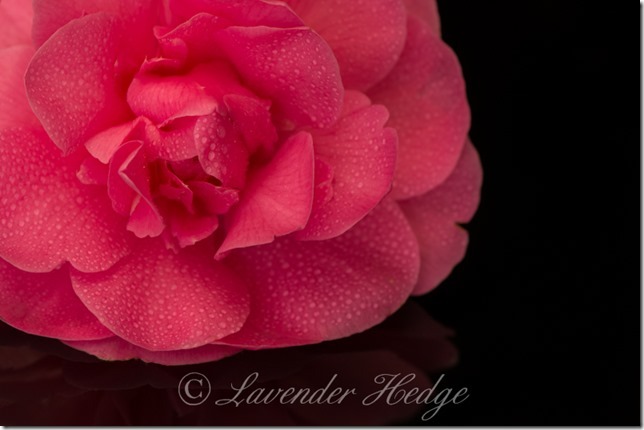 This one seems well behaved on clay soil. 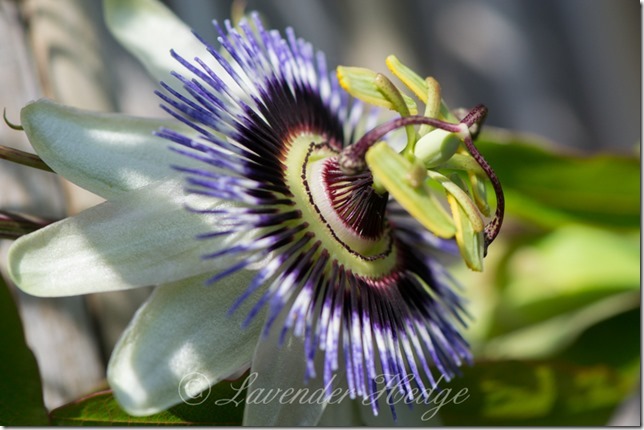 The Passion flowers are really enjoying all the warm, sunny weather we have been having recently. They are such exquisite works of art! 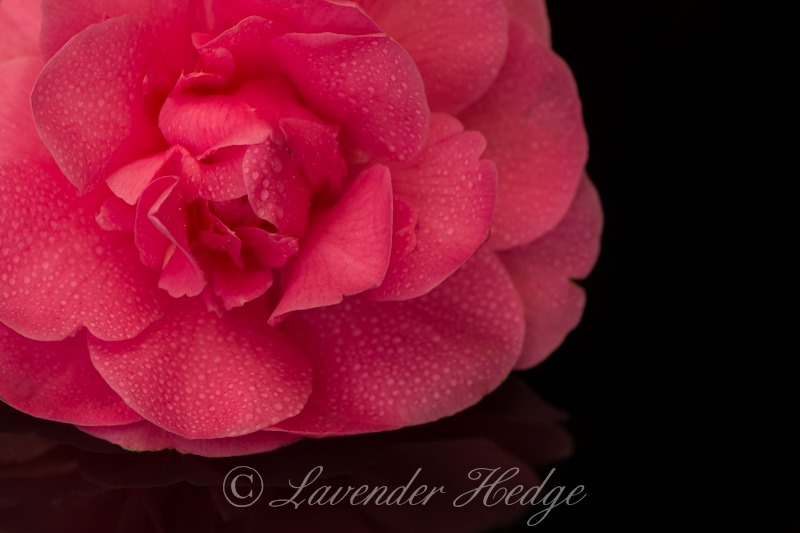 My Camellia shrub has loads of flower buds this year, but unfortunately something has nibbled the ends of the buds so that when the flowers open, the petals have scalloped edges! I suspect a snail is the culprit. This one appears to be unscathed. 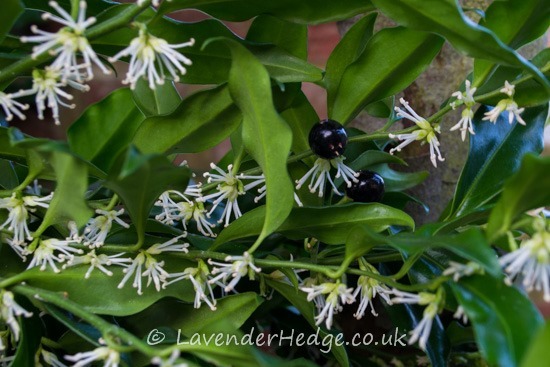 The flowers on this evergreen shrub are quite unspectacular and you could easily pass by without noticing them, if it wasn’t for the fragrance that fills the air. It is also known as Sweet box or Christmas box. 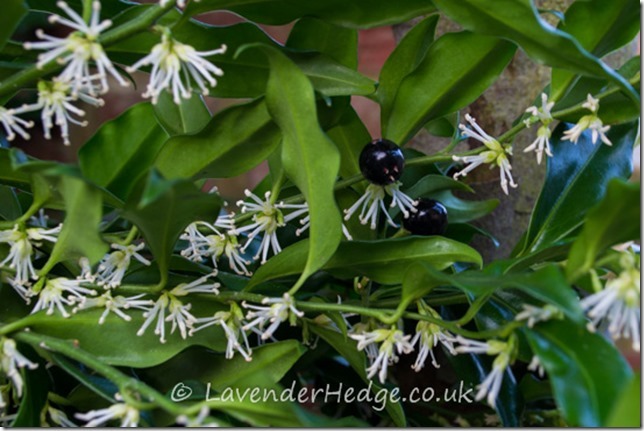 They flower from December to February and are followed by shiny black fruit. Grow close to a path where you can appreciate the scent. 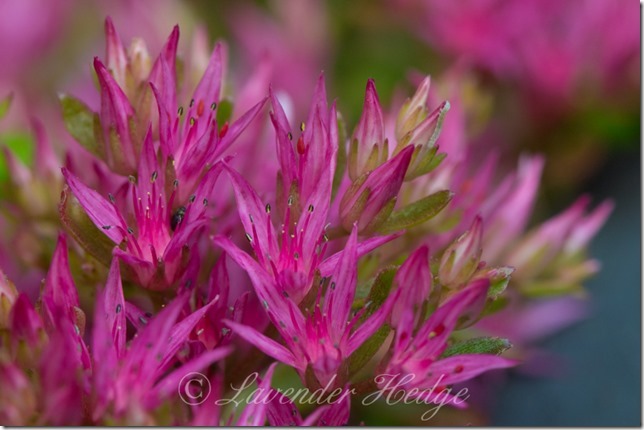 An easy-to-grow shrub that likes shade and reaches about four feet in height. It spreads a little, but is not invasive – the new shoots are easy to pull up and you can give them away to your friends. 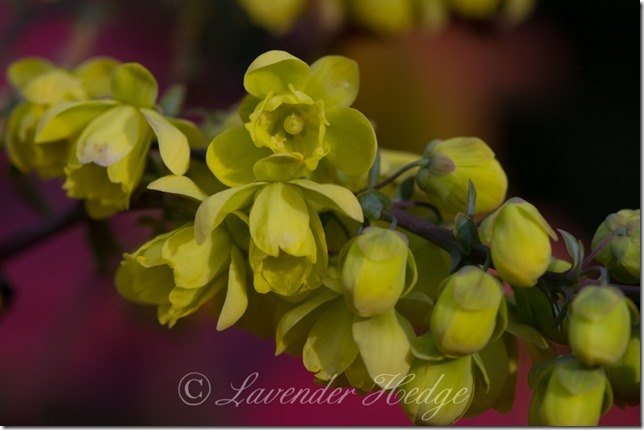 Winter sun is a wonderful name for this Mahonia, its daffodil yellow flowers contrasting with its red winter foliage. 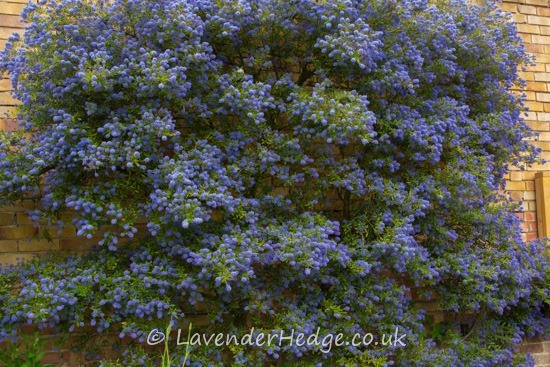 This Ceanothus ‘Yankee Point’ is in full bloom at the moment and it is positively hums all day long with bees visiting the flowers! I would certainly recommend this shrub, commonly known as a Californian Lilac, if you are looking for a relatively quick growing evergreen shrub that is easy to look after. It likes a sunny, sheltered spot. 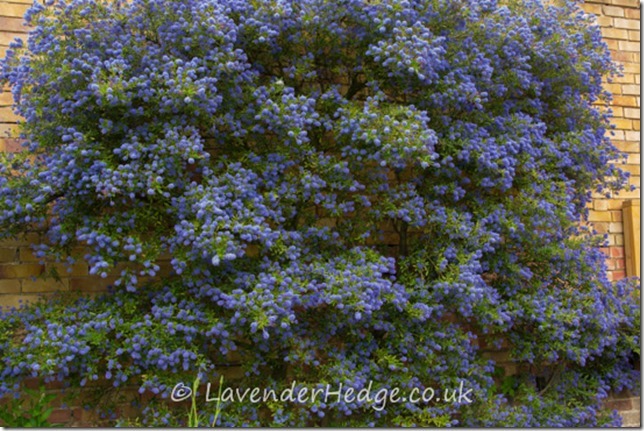 This Ceanothus covers an ugly, south-facing wall and every Spring is a mass of colour. It is self-supporting so doesn’t need wires. 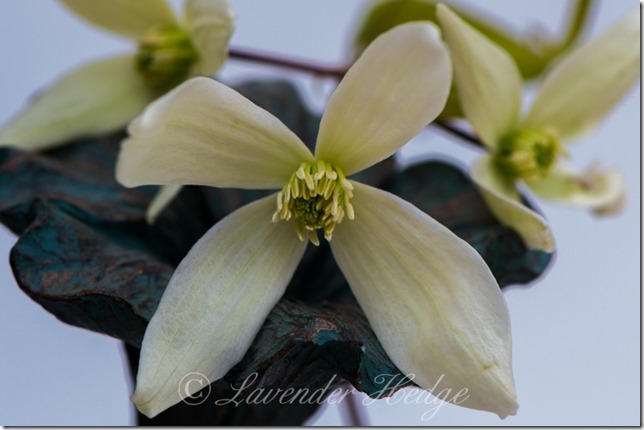 After flowering I prune it back to stop it getting top heavy, and restricting its width. It was labelled as growing to five feet in height, and eight feet wide, but it has reached around 15 feet high and wide and I keep it to this size by pruning.